Last night was the premiere of the last trailer for Guardians of the Galaxy. A lot of stuff wasn’t new, but what was new was that our new villain explained herself. And Nebula got enough screentime to help us chart her path. We begin where we have seen so much before: on a floating platform above Ayesha’s planet with the team preparing to fight the giant tentacled thing. We also know that Ayesha has hired the team and that this sequence is really early in the film. New to this is footage showing Star-Lord with a device that predicts when the tentacle creature will show up. This is from later in the trailer and later in the movie, but I bet dollars to donuts Star-Lord says something like “Guns are totally your thing” after this. Also worth noting that the creature Ayesha hired them to get rid of doesn’t live there, but pops in out of space. Ayesha is probably one of, if not the main, villain in this film, so there’s probably some deceit involved in what she’s hired the Guardians of the Galaxy to do. Apparently part of their plan to fight the monster involves the power of music. 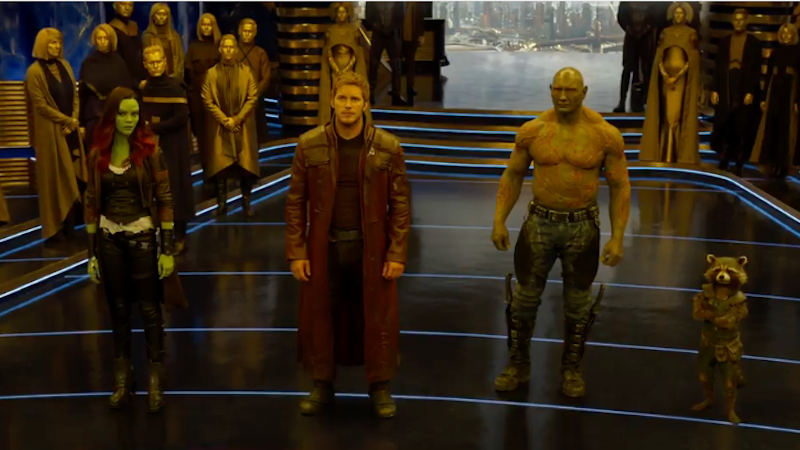 Actually, the speakers scene is from a different time on Ayesha’s planet, since Groot is in a red Ravager-like outfit in this and in this scene on the platform (from later in the trailer), he’s his usual naked self. But the rings and fire behind him show they’re similar locations. It seems like Ayesha’s giving her villain justification: to kill creatures that pollute the universe with their weakness. I’m wondering if she hired them to kill the creature as part of her cleansing plan, has them fight the creature to reveal their weaknesses to her, or what. Someone brings Nebula to Gamora—note that the gold people in the background tell us this is Ayesha’s planet AND that Nebula is in this hooded cloak. It seems likely that the Guardians leave with her. “No, we’re family. Except maybe her,” says Drax, nodding in Nebula’s direction. Again, I think this scene is when they return to that planet, since Nebula appears to be part of a team by this point. And I think it takes place before the Guardians meet Ego and Mantis, since she’s in handcuffs here. Maybe Nebula joins in on the Reaver mutiny against Yondu when the team gets captured and then ends up in cuffs? Also, the color doesn’t look like her red jacket. And it’s sleeveless, while her red one, which she wears fighting with the team later, has one sleeve. See, one sleeve. And a great shot of the whole team in the bowls of the weird spiney planet we see them fighting near later in the trailer. We know that, at some point, the Ravager and the Guardians meet up and there’s a jailbreak from the Reavers. But this part looks like it takes place before the revolt that kicks Yondu out of power. We’ve seen part of the battle against these round ships before, but the freeze frame here shows a gold person inside, so we know they’re Ayesha’s forces. “You know, they told me you guys were conceited douchebags, but that isn’t true at all,” says Rocket in response to Ayesha’s statement. At some point, it’s just Groot and Star-Lord in the Milano. I think this is a battle with the round things. We’ve seen the blue gravity wave scene before, but now there’s a bit more detail on how Rocket set the trap. Rocket: “So we’re saving the galaxy, again? Awesome, we’re really going to be able to jack up our prices if we’re two-time galaxy savers.” I almost want to say Rocket’s hijacked on of the Sovereign’s (the name of Ayesha’s people and also possibly their planet) round pod ships, but the zoom in shows there’s more on the other side, so I don’t know exactly what kind of ship this is. It’s very pretty and housing some very bad people. We’ve been seeing a lot space battles around this weird sort of coiled-up planet, which might be Ego’s. It looks constructed and a bit alive, which is a new way to interpret the “Ego the Living Planet” thing, since they didn’t go with “literal giant head in space” for Ego in this movie. You can see the planet’s tendrils move in this shot. In her Ravager red jacket and her own Reaver ship, it looks like Nebula is chasing down Gamora. After the events of the last movie, I bet the disgruntled members of Yondu’s crew and Nebula have similar feelings where the Guardians are concerned. This shot is inside Ego’s ship. The yellow and white give it away, since we see this design when the ship’s door opens later in the trailer. This is from the very end of the trailer, but you can see the matching designs. Plus, we saw them in a room like this in the teaser trailer. This door-breaking is probably on the Sovereign planet—the door design looks right—but since Mantis is with them this time, they appear to have gone back there to stop her. And, of course, the ending has Ego introducing himself as Peter’s dad. There is a lot going on and I bet much of it is from early in the movie to preserve the surprises. That said, based on clothing and other clues, I think that the team is hired by Ayesha, finds out something is up with her (maybe from Ego? ), hatch a plan while dealing with being hunted down by the Ravager, have to fight of the Sovereign’s attack on Ego’s planet, and have another showdown back on the Sovereign planet. As for Nebula, she either starts out their prisoner, joins the Ravagers, and then joins the Guardians. Or just starts out trying to kill them, gets captured, and is seduced by the “family” that they’ve made. That’s all guesswork, albeit very well-educated.